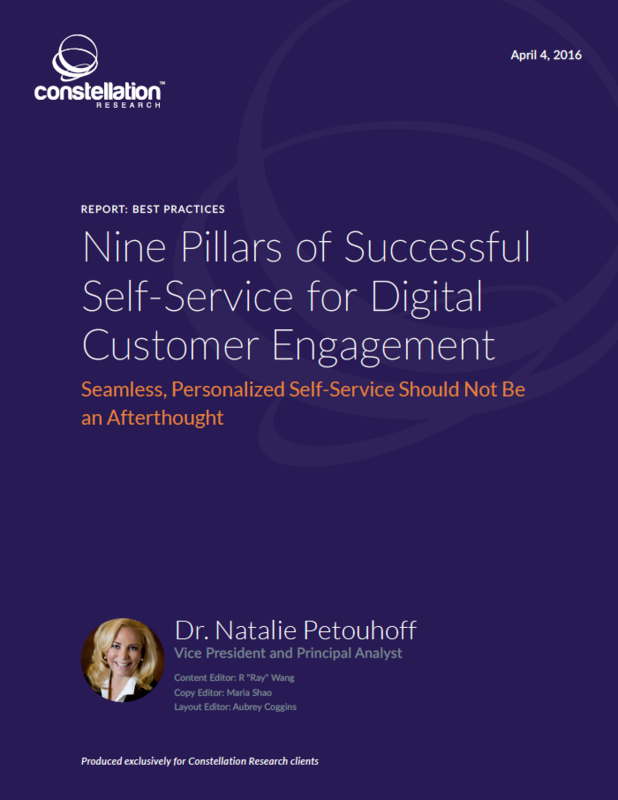 Nine Pillars of Successful Self-Service for Digital Customer Engagement | Constellation Research Inc. Organizations are battling each other to deliver the best customer experience for the right customer at the right time in the right channel. Customer service and customer engagement now play key roles in digital transformation strategy. However, leaders often stigmatize customer service or customer care as a cost center. This paradigm is false. Today, customers can contact a company in any channel, so self-service should not be an afterthought. It should cover any channel, including voice, text, chat, mobile and Web. A company should analyze the data from the customer’s prior interactions to successfully resolve an issue in self-service. When a company uses the context of prior interactions in current interactions, the service becomes faster and more efficient. Multi-modal self-service revolutionizes self-service by enriching the presentation of information in one channel with information and assistance from another channel. Self-service should drive digital customer engagement and be considered the primary customer interaction channel. Customer engagement done well enhances customer loyalty. Done poorly, it opens the door to competition. This research is based on in-depth customer interviews and field research.